Weighing just 98 lbs and requiring only 3-4 inches of water underneath the boat for floatation, the Flycraft Stealth Boat is as versatile as it is convenient. 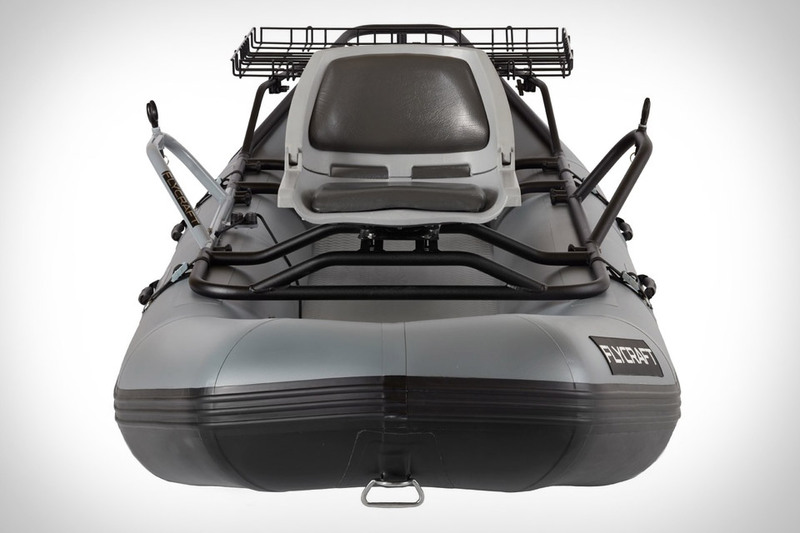 Designed specifically for fishing, its 12.5-foot inflatable base allows it to be transported in a trunk, yet the floor is surprisingly rigid. Two layers of PVC armor protect it from sharp objects, and it has four layers in key wear points for added durability. It can accomodate two adults, whether standing or seated, thanks to the dual swiveling seats and a rigid aluminum frame, and can handle motors weighing up to 30 lbs., making it capable of handling a wide variety of water types, from tiny streams to oceans — no trailer required. Sure, you can carry a separate firestarting kit when heading into the wilderness. But you're already wearing shoes, so why not just secure them with some Survival Laces instead? Available in a number of lengths, these replacement laces work for everything from footwear to hoodies, and hide a ferro rod, tinder, and fishing line inside their paracord exteriors. To access them, just remove the metal aglet on the end holding the tinder, start your fire, and pack the unused tinder away for your next fire. There's a reason that guns are great for self-defense: they let you subdue potential attackers and intruders from a safe distance. Unfortunately, they're all too often involved in accidents and unintentional shootings, making gun safes a must. The Salt Self Defense Gun was designed to offer the long-range protection benefits of a gun without the potentially lethal side effects. Shaped like a traditional handgun, it shoots rounds filled with a powdered mix of chemicals that create a toxic cloud upon impact, incapacitating anyone in the vicinity. That means you don't necessarily need to hit your target to stop them, and should it go off by accident, there won't be any serious injuries, either. Thanks to a smart four-pivot design that lets it fold up flat while staying assembled, the Gerber Freescape Camp Saw makes for an ideal adventurer's packalong. When folded, the blade stays protected, so you don't need to worry about it ruining any of your other gear, yet it can handle larger logs and lumber when unfolded thanks to the replaceable, standard 12" blade. The textured rubber overmold grip gives you a secure handle, and its bright green accents make the tool easy to spot in your bag. When you're adventuring in the outdoors, removing unnecessary stuff from your pack can make your trip more enjoyable and your back a little happier. The Pint Canteen lets you do so with a single item that's ingeniously designed to serve as both a bottle and a cup. This clever vessel also uses double-walled stainless steel construction to keep warm beverages hot and cold beverages cold, has a 16 ounce capacity, and is available in two colors: a speckled gray granite or carbon black. Make your trip to and from the stream as easy as possible with a Tenkara Pocket Fly Fishing Rod. These collapsable rods are made from carbon fiber, and shrink down to just 10 inches when collapsed. They come in two models — the Sawtooth and Teton — which extend out to 9 and 12 feet while weighing just 1.1 and 1.9 ounces, respectively. Each one comes packed in a protective sock and tube, includes line, line clips, flies, and a tippet, and will fit in nearly any bag so you can always be prepared. Jeeps and trucks make great vehicles for exploring the great outdoors and accessing remote areas. Hammocks are ideal for lounging in said remote places. The Jammock Hammock takes advantage of these facts to provide you with a place to relax, whether there are any trees around or not. Available in two models, it attaches to either the roof of your Wrangler or the bed of your truck, is made of durable 1000 Denier Cordura Nylon, and, in the case of the Jeep model, uses reliable NRS buckles for added strength. Just remember to set your parking brake before you hop in.